We concentrate here on the independent review of the Scottish planning system, the findings of which were published last month (see below), and recent changes in Historic Environment Scotland (click HERE to go direct). Crawford Beveridge (chair of the Scottish Government’s Council of Economic Advisors and Non-executive Chairman of the Board at Autodesk Inc.). John Hamilton, (Winchburgh Developments Ltd. and former Chairman of the Scottish Property Federation). Petra Biberbach (Chief Executive of Planning Aid for Scotland and a Member of the Board and Chair of the Planning & Access Committee at Loch Lomond and the Trossachs National Park Authority). The panel certainly gave value for their efforts, producing a detailed and fulsome set of forty-eight recommendations. We consider that the highlight recommendations are as follows. Strategic development plans should cease. The main issues report should be removed and replaced with a single, full draft plan. Removing or limiting the scope to produce supplementary guidance. Local development plans should move to a 10 year cycle. Development plan examinations should be replaced with a frontloaded ‘gatecheck’ of the plan. The National Planning Framework should define regional housing targets. Options for a national or regional infrastructure levy should be defined and consulted upon. A development delivery infrastructure fund should be established, which could be partly resourced by a mechanism to capture land value uplift. The certainty provided by the development plan in development management should be strengthened. To incentivise this, allocated sites should be afforded planning permission in principle, could be exempted from pre-application consultation requirements and could benefit from fast-tracked appeals. Planning authorities should work together to identify the scope for significantly extending permitted development rights. Planning fees on major applications should be increased substantially. A new means of measuring service quality which builds on performance frameworks, and a mechanism for penalties such as a refund in the planning fee to be incurred where this is not achieved. Scope for further discretionary charging, for example for pre-application processes, should be considered further. The panel are not persuaded that third party rights of appeal should be introduced. We welcome the recommendation that the development plan should retain its primacy in the Scottish Planning system. We suspect that few will mourn the recommended demise of Strategic Development Plans, subject to the National Planning Framework having an effective city-region content. However, just as we are gradually achieving a 5-year cycle for Local Development Plans – and therefore that the plans are genuinely up-to-date, the recommended 10-year cycle would be a very retrograde step. Our experience has been that Development Plan “Main Issues Reports” have not been a particularly useful element of the 2008 system, especially as many Councils have introduced a non-statutory earlier “call for sites” or other community-based stage; and therefore we agree with the recommendation to scrap them. Perhaps the later recommendation of early engagement with the entire “community”: residents, developers, landowners, housebuyers, young people, etc; would be a more meaningful start to the process. A check on the fervour of planning authorities to churn out Supplementary Guidance is very welcome. There now seems to be a universal enthusiasm – started by Glasgow’s first City Plan some years ago – to provide guidance on every last detail of every possible development scenario. In practice, this guidance is usually treated as policy! Aberdeenshire now has Supplementary Guidance, and then further Guidance on how the interpret the Guidance! All this Guidance – some may say ‘policy’ is enforced with far too little external scrutiny or examination. In this regard, we are seriously concerned about limitations on development plan examinations. This is the one occasion when plan-making is subject to independent scrutiny and its loss would have a serious impact on the ability to allocate sufficient land for the nation’s housing needs. The recommendation that a development plan allocation has the status of Planning Permission in Principle is strongly supported. This would focus attention on development plans as the prime vehicle for making land-use decisions, and prevent the situation where the principle of development on allocated sites is the subject of further debate at application stage. Suggestions of a mechanism to capture land value uplift take us back to the 1948 Act which introduced a development charge or “betterment” to capture the uplift in land value which arose when permission to develop land was granted, even for small projects. The effect was to bring a halt to most development, and its repeal shortly afterwards. There is concern that infrastructure funding may move away from locally-justified requirements to a nationally-managed fund, which may not prioritize infrastructure investment in the locality of those paying the money. We are aware that fees for major applications in Scotland are much lower than equivalent fees in England, but the Scottish fees were not similarly increased because it was felt that the time was not right to increase the burden on economic development. Our view is that if fees are to be significantly increased, the recommended penalty system for non-performance should be imposed. We support the extension of permitted development rights. There are still far too many minor building operations that require planning applications: minor alterations to offices, factories, warehouses and shops come immediately to mind. We are thoroughly relieved that the panel were not persuaded that third party rights of appeal should be introduced! The significant recommendations, in our view are as follows. The blue headings are the panel’s “outcomes” that the recommendations are designed to achieve. The primacy of the development plan should be retained, but focussed on outcomes, rather than policy and procedure. An enhanced National Planning Framework should address long term city-region development and infrastructure issues more fully and effectively. The National Planning Framework should be more fully integrated with wider government policies and strategies. 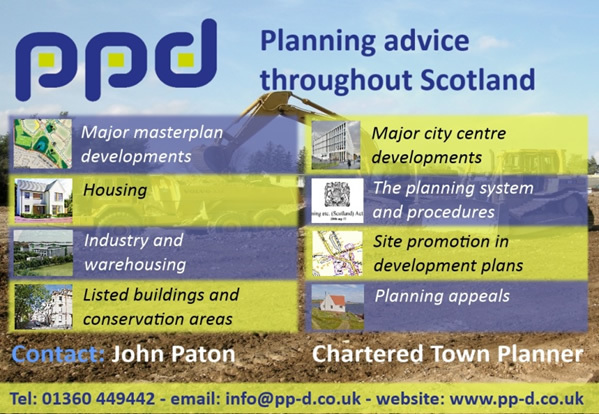 The role of the Scottish Planning Policy (SPP) should be expanded to avoid the need for policy to be repeated in development plans. Local development plans should only set out where these policies are being varied to reflect local circumstances. Further consideration should be given to integrating the SPP with the National Planning Framework, with both being afforded the same statutory weight as the development plan. The plan preparation process should be simplified. The proportionality of supporting information, including environmental assessment, should be addressed. Local development plans should move to a 10 year cycle, with a 20 year vision and focus on place, rather than policy. Development plan examinations should be replaced with a frontloaded ‘gatecheck’ of the plan. Only after agreement is reached on key parameters for the plan, should a fuller, locally driven discussion on place and development sites move forward. Where early agreement is achieved there should be no need for further scrutiny or intervention at this later stage. The National Planning Framework should define regional housing targets as the basis for setting housing land requirements in local development plans. A clearer definition of effective housing land so that local development plans can move on from this to take a positive and flexible approach to addressing the housing land requirement for their area. A national infrastructure agency or working group with statutory powers should be established, involving all infrastructure providers as well as planning representatives. A corporate structure requiring all key infrastructure providers to co-operate in delivering the local development plan should be introduced. A review of transport governance should be undertaken to address the gap between this key aspect of infrastructure and development planning. Our view is that transport agencies at the national and regional scales should be given a clearer mandate to directly support the delivery of development in accordance with the development plan. Future school building programmes should address the need for new schools in housing growth areas. Section 75 planning obligations should be retained but their use should be minimised and the process streamlined. Timescales for decision making remain critical in creating certainty and should remain part of the performance monitoring framework. Processing agreements should be required for all major developments. The quality and effectiveness of pre-application discussions with planning authorities and consultation by developers should be significantly improved. National guidance on minimum requirements for validation is required. A fuller study of the scope for combined consents, particularly planning, roads and drainage consents, should be carried out. Planning fees on major applications should be increased substantially, so that the service moves towards full cost recovery. A revised cap should be considered to better reflect the level of resource they demand. Local authorities must accept that all increases in fees must be directly linked with improved performance and that this will require investment in the resourcing of planning authorities. We also recommend a new means of measuring service quality which builds on performance frameworks, and a mechanism for penalties such as a refund in the planning fee to be incurred where this is not achieved. There should be a continuing commitment to early engagement in planning, but practice needs to improve significantly. Communities should be empowered to bring forward their own local place plans, and these should form part of the development plan. Community councils should be given a statutory right to be consulted on the development plan. We are not persuaded that third party rights of appeal should be introduced. A new statutory right for young people to be consulted on the development plan should be introduced. Historic Environment Scotland is the body formed last year which took over the functions of Historic Scotland and the Royal Commission on Ancient and Historical Monuments of Scotland. Listed building consent and conservation area consent (the process for applying for and determining applications for listed building consent and conservation area consent). It has also produced “HISTORIC ENVIRONMENT SCOTLAND POLICY STATEMENT”. This replaces the previous “Scottish Historic Environment Policy” with updated operational policy and legislation, so SHEP becomes HESPS! The content of the new HESPS is very similar to SHEP. It is stated that the document guides the operation of decision making in the Scottish planning system, and sets out how Historic Environment Scotland fulfils its regulatory and advisory roles and how it expects others to interpret and implement Scottish Planning Policy. It is a material consideration in the Scottish planning system. Put simply, Circular 1 says what the policies and procedures are, and HEPS says how they will be interpreted and implemented. Historic Environment Scotland is developing a detailed plan for engaging the sector in a fundamental operational review of how it undertakes its regulatory activities with a view to a longer term amendment or replacement of this policy statement as required. They will be providing further information on this shortly and will commence the process in the summer.